Does the Sound of Noisy Eating Drive You Crazy? It May Be More Than Bad Manners. Popcorn munching? Gum chewing? Knuckle cracking? Nose sniffing? Yawning? Soup Slurping? These sounds may grate on your nerves but those who suffer from misophonia can have excessively negative and immediate emotional and physiological responses to trigger sounds. Sensitivity to certain sounds can have a negative effect on a person’s life causing problems with activities of daily living. Being in a public space can be particularly difficult for those who suffer from this condition, known as misophonia. I observed this recently, in the waiting room of my office: My waiting client suddenly stood up, started to yell at my departing client, and then covered his eyes with the book he was holding in an effort to regain self-control. What possibly could have caused this intense reaction? The client who had left my office was chewing gum, something most people would not even notice, and my waiting client has misophonia. What is misophonia? 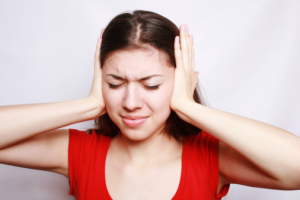 Misophonia is defined as a severely negative emotional reaction to certain sounds. People with misophonia react to specific sounds called trigger sounds. Visual actions that involve that sound (such as my one client seeing my other client chewing gum), can also cause severe reactions in the person with misophonia. Responses can range from moderate discomfort to rage and panic as the brain’s fight or flight response is rapidly activated. For many years, misophonia sufferers have faced skepticism from family, friends, and health care providers. Very recently, however, scientists have discovered important evidence that indicates that the brain activity in people with misophonia differs from that of people without the disorder. Specifically, in response to trigger sounds, people with misophonia exhibit much greater activity in portions of the brain involved in processing emotions, memory, and decision making, particularly the anterior insular cortex, than do people without misophonia. The researchers also found that sufferers display an increased heart rate and sweating when triggered. Since Pawel and Margaret Jastreboff first coined the term misophonia in the early 2000’s, researchers have been trying to better understand this disorder. While the condition occurs more frequently in people with obsessive compulsive disorder (OCD) and post-traumatic stress disorder (PTSD), many sufferers appear to have no other psychiatric conditions. Common trigger sounds include eating noises, nose sniffling, lip-smacking, pen clicking, tapping, and typing. Though these noises go largely unnoticed by most people, they have a major impact on people suffering from this disorder. Misophonia can bring tremendous stress and difficulty to the relationships of those suffering with the condition, as the people closest to the sufferer often make the noises that trigger their strong reactions. Additionally, individuals with misophonia frequently become socially isolated as they attempt to avoid environments that contain their trigger sounds. They also often have trouble keeping a steady job or performing academic tasks because they cannot control the sounds that other people make in work or school environments. The exact cause and prevalence of misophonia is unknown and, for now, there is no completely effective universal treatment for the condition. In general, treatments for the disorder focus on helping clients change their cognitive and behavioral responses to their environments. Modalities include cognitive behavioral therapy, which involves changing negative thoughts and/or using self-distraction to help cope more effectively with trigger sounds; deconditioning wherein the misophonia trigger is paired with a positive experience; and progressive muscle relaxation, which teaches the individual to tense and relax different parts of the body to decrease overall stress level. Adding background noise to the environment, such as fans and white noise makers, can also help individuals with misophonia ignore their triggers and avoid negative reactions. Medication is not normally used to treat misophonia, but may lessen the symptoms in individuals with other psychiatric conditions. Finally, given the research noted above, scientists have recently posited that neurofeedback, wherein clients regulate their reactions to trigger sounds by observing and modulating their own brain activity, may be an effective treatment for the disorder. My client and I are working on changing his reaction to others who chew gum around him, such as by letting go of his thoughts that they are doing it on purpose to upset him and redirecting his attention to the task at hand. When he is at school, he makes sure to sit near the door of his classroom, so that he can quickly escape if needed. Additionally, he is beginning to tolerate seeing gum in its package, and we will work up to his being able to sit with me while I chew gum. Misophonia, like OCD, is a condition few people understand. To a non-sufferer, the behavior of a person with misophonia may seem quite odd, but evidence clearly shows that it is rooted in the functioning of the brain. Knowing this will help not only in developing effective treatments, but also in moving us closer to ending the stigma of people with this often-debilitating disorder. Theresa Shank, Ph.D. is the Director of Psychological Services at CPE Clinic, LLC. She specializes in the treatment of anxiety disorders, obsessive-compulsive disorder, and body-focused repetitive behaviors in children, teens, and adults. Ruby Turner, a senior at Howard High School, participates in the G/T Research Intern Mentor program that has afforded her the opportunity to work with Dr. Shank. After graduation in May, she plans to attend college in pursuit of a Bachelor’s degree in School Psychology. To shop or not to shop? Will they behave? Parenting approaches that help. Superhero Parenting: 80 years strong.